Many homes miles from the Atlantic Coast are now waterfront property. CRUSOE ISLAND, N.C. — This corner of hurricane-ravaged North Carolina is so isolated that the locals say there's just "one way in and one way out." Now, in the wake of Florence, the only way out for many on Monday was by boat — or with the help of the National Guard and the Coast Guard. "Those folks down there are pretty much cut off," said Andy Horne, 66, his finger pointed in the direction of flood-covered Dock Road near New Britton Highway East. "There's only one way out of Crusoe Island." Even when the weather is fine, Crusoe Islanders, who are believed to be the descendants of French settlers who fled Haiti during the Slave Rebellion in the 1790s, tend to stay put, said Curtis Green, 69, who lives in the area. "Some of them people never been out of there," he said. "So many people ain't never been out of there except to go to a doctor." Across North Carolina, officials reported 2,600 rescues from the storm as of 12:45 p.m. Monday, as the rain continued to fall and swollen rivers continued to rise. Of 31 people who died in the storm in the region, 25 were North Carolina alone. While remnants of Florence were moving north into the mid-Atlantic and New England early Tuesday, the National Weather Service warned that that "major river flooding will persist in the Carolinas through the week." Lori Long, a paramedic with deep roots in Crusoe Island, said her mother and cousins had to be rescued — and lots of their neighbors were also trying to escape the rising waters. "My family is some of the original people from down there," Long said, adding that the situation was worse than Hurricane Floyd in 1999, when flooding lasted for weeks and caused billions in damage. "It's rising much faster — about an inch and a half an hour now." While Long spoke, three red Coast Guard boats could be seen plying the flooded fields and a National Guard truck rumbled past carrying about a dozen rescued people and their pets. A bit north of there, near the small town of Whiteville, floodwaters turned homes some 40 miles from the Atlantic Coast into waterfront property. "We are like in a island," said Scottie Harper, who lives on the edge of Whiteville. "We are completely surrounded by water. And town ain't a mile away." Reba Batten was crying outside her home when a reporter arrived. The nearby marsh was now a lake lapping at her porch. Recently widowed, Batten said she had spent Sunday night praying at a neighbor's house for deliverance. "You do feel sort of isolated, you feel deserted," Batten, 74, said. "I've lived here 56 years and never seen this before. I just hope I have the strength to get through this. I have the faith. I hope I have the strength." Over in Lumberton and in the areas around the city, the Coast Guard was working nonstop to get people in low-lying, flooded areas to higher ground after the Lumber River overflowed its banks. 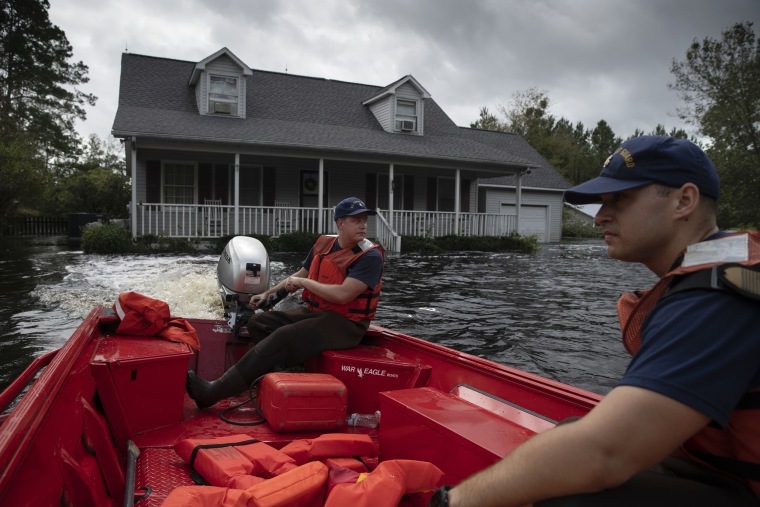 "In Lumberton, we watched the town start to flood out," said Jason Murphy, a Coast Guard machinery technician who got his feet wet — literally, at times — rescuing stranded residents after hurricanes Irma and Katrina. "Everywhere we go it'll be hit or miss. There'll be spots where it's high and dry and then that." By that, Murphy meant a nearby fire station where a dozen people had sought shelter at their height of the storm — and which was now being evacuated because it was surrounded by a four-foot-deep moat of water. Murphy said they are operating in an area where the distances are far and the roads are unfamiliar and often flooded out. He said they are trying as quickly as possible to respond to rescue calls — and a lot of it is white-knuckle driving. "It's incredibly frustrating, it's incredibly stressful," he said. "We'll have convoys of five, six, seven vehicles. I got to make sure I'm going the right way and I can't see where I'm going. It's just frustrating, stressful and a lot of fingers crossed." Motorists trying to get out of Wilmington faced an obstacle course of fallen trees, crumpled asphalt and washed-out roads that often left them no option but to turn back. Many gas stations were shuttered because supply trucks were unable to get into town. So were many food stores. And thousands were living without power. Statewide, 342,884 customers were experiencing electricity outages at 11 p.m. ET Monday, officials said. In nearby Pender County, 150 people were rescued after the storm, said Tommy Batson, the county's assistant director of emergency management. People were plucked from cars, from rooftops, from trees, from homes submerged in 10 feet of water, he said. And the flooding is not likely to recede for at least a week. "If you're on high ground and not in harm's way, please stay put," Batson said. "The river levels are beyond anyone who's alive here has seen." It's worse than the aftermath from Hurricane Matthew in 2016, he said. "Rebuilding will take years," he said. John Gordon, who flies rescue choppers for the Wilmington Police Department, said the bird's-eye view of the devastation is astonishing. "It looks like rooftops in the middle of the ocean," he said. Phil McCausland reported from Crusoe Island, Jon Schuppe from Whiteville, and Corky Siemaszko from New York.